Why Are Burr Coffee Grinders Better Than Blade? Life can bring you situations where you may have a fork in the road ahead of you and have to choose what path to take: either left or right. You may say, “Which way should I go?” You see, the coffee life brings us to situations where we, too, may be presented with a fork and are forced to make decisions. Among those decisions comes the topic of choosing a grinder. As a subtopic to grinders there is a decision to make, burr or blade grinder. Today, we are going to talk about this – why burr grinders are better than blade. So if you have questions regarding this subtopic of grinders, then you have come to the right place. Any barista or coffee enthusiast will tell you that in the assembly line of a perfect cup of joe, one of the most important pieces of equipment is the grinder. Coffee professionals tell us that we should be buying our grinders first. Regardless of your opinion of this suggestion, the point is that we should be focused on and prepare ourselves for the end product of our cup of coffee. When people think this, they reckon the coffee beans to be the most important part. As you see from this, we frequently fail to realize that poorly ground coffee beans will only bring you problems in the taste of your coffee. Good beans need and deserve the right grinding for the quality of coffee they will create. A blade grinder is pretty easy to explain. They have a screw-shaped blade in the center of the grinder , which works a lot like one that you would find in a blender. A burr grinder is made up of two abrasive surfaces that revolve (those are the burrs), in between which the coffee beans are generally ground a few beans at a time. The flat burrs, as you see above, are different from the conical burrs, but they both do the same thing: turn coffee beans into coffee grounds. 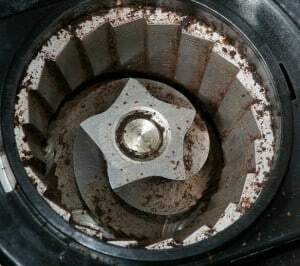 Conical burr grinders have two cone shaped burrs with ridges that grind (a more correct word would be-crush) the coffee beans, while the flat burr grinders have two flat, identical, and face-serrated rings. 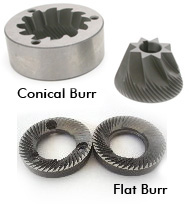 Regardless of which burr type you’re using, one of components is stationary and the other is turned by the grinder’s motor. The distance between the burrs can be varied which will change the size of the coffee grounds. Conical burr grinders are leaned on by experts and I think I agree with them on this. High-speed burr grinders tend to heat the coffee beans up the same way as blade grinders. That is not a good thing, but the upside of high speed grinders is that they give the user more control over the grind size and they tend to be pretty consistent. They are often called “direct drive” grinders because the motor is directly connected to the burrs and so both the motor and burrs turn at the same speed. The downside to high-speed is that it has more of a tendency to create dust or powder, though are still way better about it than blade grinders. They also tend to cause problems with static. Among the coffee lovers, the most desired grinders are the low-speed burr grinders. These offer very little to no static charge, they are very quiet in their operation and produce very little heat to the beans. They have options of “direct drive” or “gear reduction” grinders. In my research I have found that, in general, burr grinders are hands down the best for making coffee. Everyone has different space and convenience needs, of course, and grinders come in different shapes and sizes of manual and electric models, so if you are looking for a more sleek and compact form I might suggest you look into manual burr grinders. Manual burr grinders: DuraCasa, Galleany, Kona Slim, Bruntmor Slim, Blisslii, Kuissential, Hario Skerton, and Tanors Mill. Phew! I know this was a lot to take in. By now your brain may be mush, but I really hope you took the time to educate yourself by reading this article completely. My aim was to clearly explain why burr grinders are better than blade and to explain things within that topic that aren’t usually considered. Both you and I can now come to the realization and conclusion that burr grinders are definitely better than blade grinders. Thank you for reading and letting me help you achieve the best cup of coffee that you can offer yourself. As I always say, I hope that you are now more educated and equipped to face the world of coffee with great boldness and confidence. ← What Kind Of Coffee Grinder Is Best For French Press?